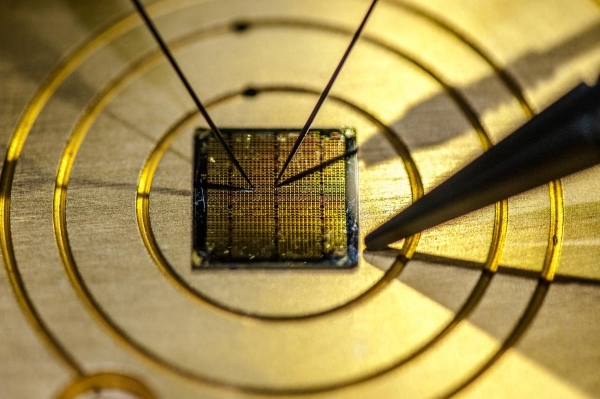 New quantum technology from a British university has been described as "making counterfeiting impossible". Developed by Lancaster University, the atomic-scale technology uses the two-dimensional material graphene to generate a unique identity tag that can be scanned by a smartphone. The researchers, who exhibited the technology at the Royal Society's Summer Science Exhibition, say they believe a future without fakes is entirely possible through the use of quantum physics. "This has the potential to eradicate product counterfeiting and forgery of digital identities, two of the costliest crimes in the world today," Lancaster University said in a news release. The identity tag is based on the irregularities that are present in graphene, which is a 2D, one-atom thick hexagonal lattice of carbon atoms that is 200 times stronger than steel. At the atomic level, these irregularities are unique, which allows for a 'fingerprint' to be generated as an identity tag. These irregularities, like a small change in the structure of an atom, are virtually impossible to replicate, meaning counterfeiters would struggle in their trade. The quantum ID (Q-ID) tag can then be read by optical technology via a smartphone app, which the team from Lancaster University and spin-out company Quantum Base have recently patented. When light from the smartphone is shone on the Q-ID the pattern of colours emitted corresponds to the unique arrangement of atoms in the 2D material. The app, which is linked to manufacturers data, determines whether a product is real or fake by matching the 2D tag fingerprint with information from the manufacturer. Professor Robert Young of Lancaster University and chief scientist at Quantum Base said: "The most exciting thing about this is it empowers the end-user. So, any person with a smartphone can verify any tag which has been labelled with our technology and verify whether it is genuine or not." The technology can be fitted and used on any surface or any product as a means to ensure its authenticity, the researchers said, including an edible version for pharmaceuticals. There is also the ability to turn off the tag should the product be reported lost or stolen. As society moves to a more digital world where the Internet of Things links digital devices, such anti-counterfeiting technology can help identify genuine products, Young said. "For example, IoT devices, where we are sharing secure information, can raise questions like 'is this smart smoke alarm a genuine device or is it sharing my emails and giving out information to a nefarious party? As we increasingly rely on digital identities, the value of these identities increases – which is why we want to make the identification process as unique as possible." The technology, which is cheap to produce, makes producing a clone as difficult as possible, and with the widespread use of smartphones growing, the easy use of the technology by the public could make counterfeiting a "thing of the past", the researchers said. "Everyone can use a smartphone to validate a pill in the third world, or a sports jersey here," Quantum Base chief executive Phil Speed told TechWorld. "It's as close to 100% secure as science will allow." Young added: "It is wonderful to be on the front line, using scientific discovery in such a positive way to wage war on a global epidemic such as counterfeiting, which ultimately costs both lives and livelihoods alike." The technology is expected to be available for commercial use in the first half of 2018.